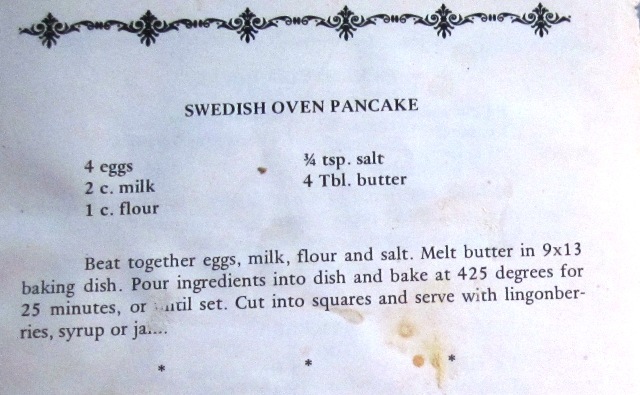 Swedish Egg Pancakes are my adaptation of two well-loved recipes (reproduced at the bottom of the page) that were thoroughly tested at our house. As you can see, the cookbook pages are fairly disreputable at this point! 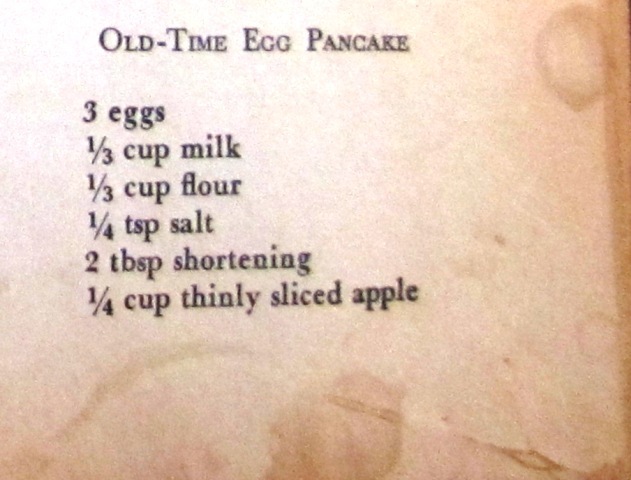 I am reliably–even indignantly–informed that these are Finnish Pannu Kakku, or German apple pancakes, or . . . lots of people claim them. If you try them, you’ll see why. They are very good for brunch, or for lunch, or for supper–and you can name them anything you like. Carole Eberly, Our Michigan: Ethnic Tales and Recipes (East Lansing: Shoestring Press, 1979). She’s done a pile of recipe books, and I don’t see how you can go wrong with any of ’em. The Wise Encyclopedia of Cookery: An Encyclopedic Handbook for the Homemaker covering Food and Beverages—their Purchase, Preparation and Service (New York: Wm. H. Wise & Co., Inc., 1949). I bought it at an Indiana farm auction in 1970 and it has been good for countless hours of entertainment, elucidation, and eating pleasure. A happy Advent to you, Gerry, and may the season bring many pancakes! Thank you, Craig – the same to you! Oh, yum, more eggs and apples! Yes, I was greedy and took both treats, Gerry. You said we could. Thank you! Of course I did, and I meant it, too. Enjoy–and then take Sarah for an extra walk!